New storm snow falling on a slick rain crust is increasing the avalanche danger. With only a moderate amount of snow from this storm, I expect only MODERATE avalanche danger. However, confidence is low in this forecast until we are able to get into the field to verify the assessment. The interface of new snow on the ubiquitous crust is expected to provide poor bonding and low friction, meaning the new snow will not stick well and will slide off easily. We also had sporadic surface hoar on top of the crust in some areas. This unusual situation may make the avalanche conditions more dangerous than normal for a storm this size. Natural and human triggered avalanches will be possible today in wind loaded areas, but are expected to be small in size and low volume. Our last Fireside Chat will be held on Tuesday at the Alaska Avalanche School in Anchorage. Topic will be Snowpack and Weather. Join us for this FREE and informal talk with Wendy Wagner. Given a relatively small amount of snow from this storm, I don't think storm slabs will be widespread without a wind loading component. Areas with deeper deposition due to wind - higher elevation, near ridgetops - will be the primary avalanche concern. Sunburst weather station recorded a gust to 43 mph this morning. The light weight, low density snow will be easily and quickly moved around by wind. Areas unaffected by wind may have a tendency to form loose snow avalanches. I expect any sluffs to be low volume and low force due to the cold, light density nature of this storm. Yesterday the snowfall started in the morning. Temperatures have risen a little bit, but remain well below freezing in all locations. Ridgetop wind has also been increasing since yesterday, with gusts reaching into the 30s and 40s from the East. Snowfall accumulation up to this point is around 6-8 inches near treeline with more expected up higher. Water content is low from the cold temperatures - this is light density powder. Today's forecasted weather is continued snow showers, with less precipitation intensity than we had overnight. A second round of snow will commence later this afternoon into the evening. 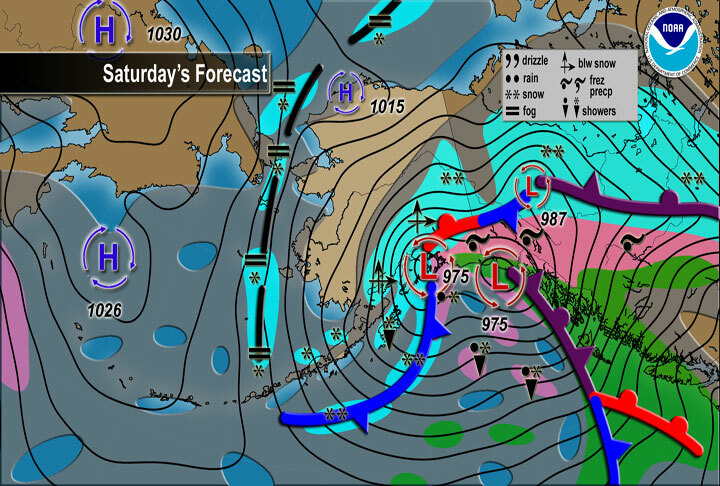 The storm is expected to taper off by late Sunday morning. When it's all said and done, storm totals may reach more than a foot of snow in some places.